Medicated Follower of Fashion: 38 weeks - birthing pool practice and hormonal meltdowns. 38 weeks - birthing pool practice and hormonal meltdowns. Wow. I really am getting close to the end of this pregnancy now, aren't I! It's so bizarre I remember this feeling from last time, the feeling that your life could change in a matter of hours at any moment. Each day I wake up and think "will it be today?". Every time I do something mundane like change the bedsheets or vac the house I think "will this be the last time I do this before the baby comes?". Saaaaaaad! Of course, last time I reached 42 weeks so there could still be another 4 weeks or so to go. But there might not!! Children. A huge mass of uncertainty from the moment they are conceived. This week we had a practice run with the birthing pool. 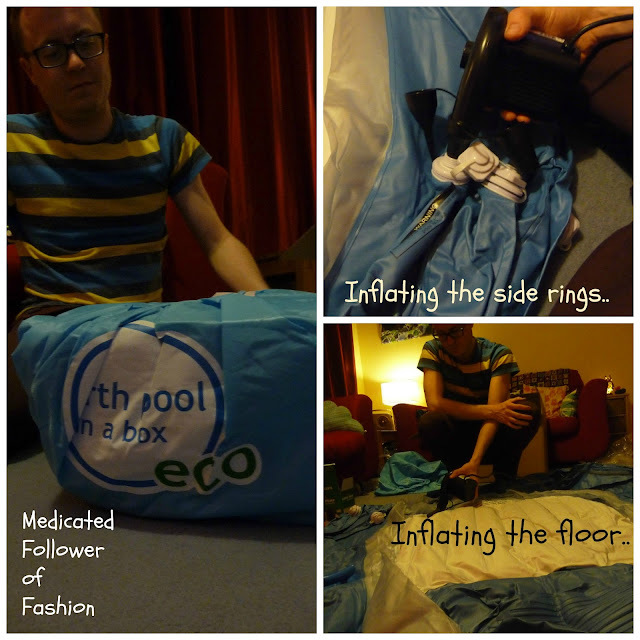 We didn't fill it due to only having one liner, just got it out of the box and practised inflating it. We also had a read through of the birthing plan and I discussed a few other things with Pete such as where things are for baby and I after the birth. I think that after that evening the imminent birth has become all the more real for both of us - Pete certainly felt so! It was definitely worth having a practice run with the pool. We now know for sure that it will fit in the living room. I discussed with Pete about putting down plastic floor covers (some came with the pool but I also have extra in the form of builders plastic sheeting and a cheap shower curtain) and putting old towels on top to prevent slipping and absorb any water/splashes. Hopefully on the day/night I'll still be compos-mentis enough to help guide Pete with what to do and what I want but it doesn't hurt to be organised. It helps him if he knows what I'm planning as well, otherwise if feels like "my birth" and not "our birth". It doesn't take too long to inflate the pool, not long at all. Maybe 15 minutes with the pump it comes with. 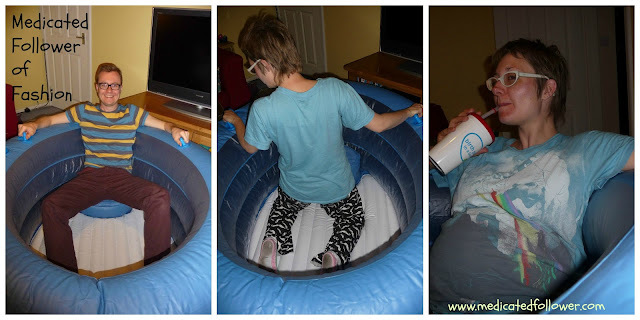 Something we found a bit tricky was the order in which to inflate the different areas of the pool (floor, seat, sides). The instructions in the booklet could have been clearer we feel and to be honest, the photographs provided weren't that helpful or clear. We did figure it out in the end but we are very relived we've done a test run so we know exactly what to do on the day. If we hadn't, it would've caused extra stress I'm sure. I might not be in a position to help on the day so it's all on Pete! We think the pool looks fantastic though. It's a good size for me. I'm not tall. I think if you were taller or wanted someone else in with you, it'd be a good idea to go for the larger sized pool on offer (we have the mini birthpool in a box). I think Pete could get in at a push if I really wanted him in there. As it is, it's a good size for me to move around in. The seat is really comfy and there are plenty of handles in different positions around the pool to aid active labour. There is also a drink cup holder which is VERY handy. You can get really dehydrated in labour and even more so during a water birth so it's essential to have a drink (with a straw) to hand! Deflating the pool was straightforward with the pump. We're very happy with the pool and excited about using it for real! I've been busy ticking more things off my to-do list this week. Ethan and I have handmade Fathers Day presents for Pete and my Dad. I won't say what yet in case Pete reads! I'm going to organise cards tonight. Then I'll wrap the presents up. Fathers Day isn't until June but I know I'll have my hands full then. I don't want to be all excuses and forget Pete and my Dad though. Pete has been supportive throughout the pregnancy and I know he'll be great in labour. My Dad is also a huge support and I know my parents will be on hand to help us post birth so I don't want him forgotten either. My parents dropped round the moses basket this week after storing it for us and I got the base constructed today so I feel happy in the knowledge we are about as ready as can be for this new little man! Hormones have been a bit crazy this week. I think the fact that the birth is so close is making me a bit antsy.. I managed to go a loopy and storm out on Pete at Tesco's this week.. embarrassing I'm still being plagued by morning sickness as well. Not every day, but it's still there a few times a week. This Tuesday we were running late getting Ethan to preschool.. We were in the garage nearly ready to leave, Ethan on his scooter raring to go when I just knew I was going to be sick. I'd already locked the door to the house so I had no choice but to try to vomit into my hands.. that wasn't enough though, so in the end I vomited onto the (concrete) garage floor. It could've been worse I suppose, at least I could wipe it up easily enough. The worst bit was Ethan standing there staring at me saying over and over "That's disgusting Mummy, really YUCKY!". Yes.. I know! The worst bit was when I realised (after dropping Ethan at school) that I had a lovely splat of sick on my boot. So lovely. Yes, this is a style blog which involves vomit on boots. Will I have a 39 week update for you? Watch this space. If things go quiet, you'll know why! You can always follow me on Instagram (@Medicated_Follower) because if there are pics of a new baby I should think they'll be on there first! Oh no not the pewk on the boot trauma! Glad everything else going well - v exciting. Excellent blog right here! I was just searching for this information for a while.Very effectively written information. Trendy Tuesday - Shwings - wings for your shoes! Trendy Tuesday - some warmer weather!